When combining Java source code, Java compiler with a .class extension converts it into Java class file. The class file includes highly optimized commands in the form of Java instructions which JVM or Java Virtual Machine executed. .class file includes symbols with every bytecode instruction stored as one byte. A Decompiler for Java can convert a .class file into Java source code. Even though it might be unsuccessful in providing the correct Java source code, from which the .class file came from, most of the code will be still the same. A decompiler will be useful in circumstances where you have lost the source code. Various decompilers provide offline and online services. 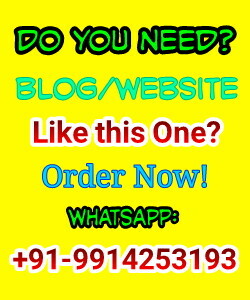 Anyone can download these decompilers and get the work done. They are friendly to work with and have great user interfaces. Listed below are top 10 best Java decompilers. Procyon decompiler is a great choice for turning the java files into .class files because it can manage language enhancements from Java 5 and more, which most other decompilers can’t do. 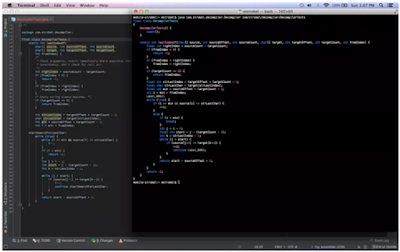 It can manage annotations, local classes, and enum declarations with ease. If you don’t want to make use of the instruction line, then you can use a GUI front end and Procyon. Procyon is still in progress, but even when it is still new, it can assist the latest Java files. 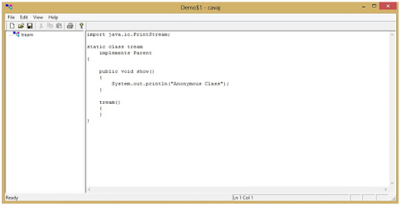 Cavaj Decompiler for Java is a freeware because it does not need installed Java to execute decompilation of a file. Anyone can use it with JAR, ZIP files, and Java applets. You can browse the renovated source code for immediate access to fields and methods using the Class View feature. It is an independent application for Windows that has a great user interface. 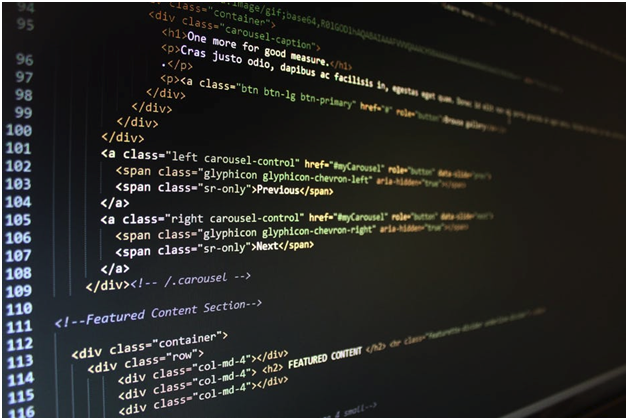 Various edits and keyboard shortcuts allow the users to work evenly with Cavaj Decompiler. You can use JD Project to decompile bytecode for Java 5 or later versions. And you could access the rebuilt code using the JD-GUI. 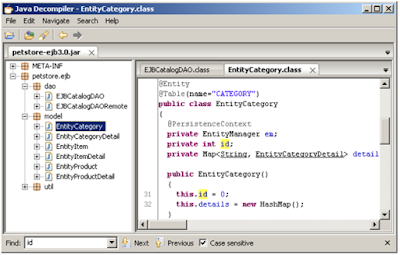 It includes JD-Eclipse plugin which is to combine JD Project with Eclipse and operate it on Eclipse platform. When debugging, it enables you to show all the Java sources. There is also an available plugin for IntelliJ which is JD-IntelliJ. It is a plugin which is still in progress, but anyone can already use it with available features. JD Project decompiler functions with most of the compilers, and it has a shortcut and drag and drops features. It enables even ZIP and JAR files. You can look through the records in a class order, and you can decompile class files showing in Java stack traces. DJ Java Decompiler is a decompiler and disassembler for the latest Windows like Windows XP, Windows Vista, Windows 2003, Windows 7, Windows 8, Windows 8.1 and Windows 10. It can decompile intricate Java binaries and applets, to create the exact source code. Again, DJ Java Decompiler is an individual application which does not need an installed JDK, JVM or Java Java. There are also drag and drop features for seamless working, and you can decompile .class files on a connected network drive or your PC's hard disk. 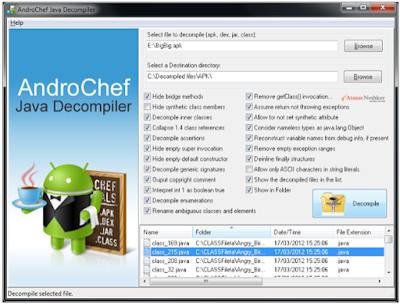 AndroChef can be an excellent choice if you are searching for a Java decompiler to see and analyze bytecode. It can convert complex Java applets and .class files into Java source code. It is only accessible for windows. Even obfuscated Java 6, 7 and Java 8 .jar and .class files can evenly decompile. It holds up Java language features like annotations, enums, and generics. After choosing the section or file of the code, you can decompile it by clicking the ‘Decompile’ button, and the data will get decompiled to the location you pick. Java Bytecode Viewer & Decompiler or JBVD is an excellent decompiler which utilizes javassist open source library for processing the conversions of the .class file into Java source file. It is accessible for devices that work on Windows platform. The program requires an installed Java on your device to operate. You can instantly make options that prompt a window for file selection in a single click. Just choose the .class or .java file, and you can see the data in the designated panel. 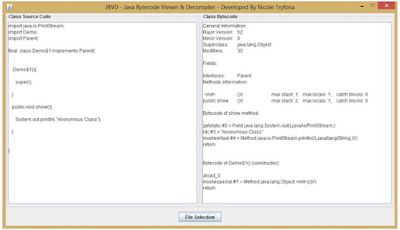 Java Bytecode Viewer & Decompiler can thus operate as both decompiler and Java viewer. Written in Java 6, CFR has the abilities to decompile newest features of Java 7 String switches and Java 8 lambdas. To decompile an entire JAR file, you can just give the jar track and get the work done. 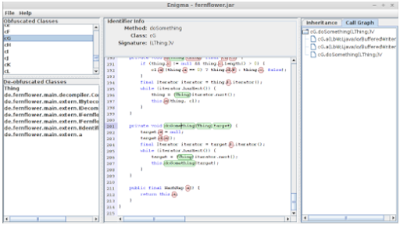 Fernflower is a systematic decompiler for Java. It is already an open source even though it is still under development. It renames all the obscured symbols and places them in a JAR file at the end. It is a tool geared specifically for deobfuscation. Used initially to deobfuscate Minecraft versions. It internally uses Procyon. It is interesting to note that many efforts into de-obfuscators and decompilers for Java is the outcome of the modding part around Minecraft, which is one of the most famous games executed in Java. It is a state-of-the-art lightweight Java Bytecode Viewer, GUI Bytecode Editor, GUI Java Decompiler, GUI Procyon Java Decompiler, GUI APK Decompiler, GUI FernFlower Java Decompiler, GUI Krakatau, GUI DEX Decompiler. As well as GUI Baksmali, GUI Smali, GUI Dex Editor, GUI APK Editor, GUI DEX2Jar, GUI Jar-Jar, GUI CFR Java Decompiler, GUI Jar2DEX, Debugger, Code Searcher, Hex Viewer, and more. It is an open source written entirely in Java. Konloch is currently developing and maintaining it. It uses CFR, Procyon, and FernFlower for decompilation, which makes it an excellent visual tool using an advanced type of decompilers. There are many decompiler selections, and you can pick according to your needs. If you are searching for a decompiler that has proper GUI and one click decompilation, you can go for the traditional decompiler choices. There are decompilers which are still under development. However, it has plenty new features for decompilation to decompile latest Java codes and obfuscated codes. Some of these Java decompilers are also Viewers that’s why even though you don’t have Java on your system, these can operate as standalone programs which allow you to run with Java code even if there’s no Java installed. As a Gold Coast SEO specialist and marketing expert, Philip Sadler loves to share his knowledge in developing effective SEO and marketing strategies for progressing companies. Whenever he has free time, he also writes articles for different websites about Digital Marketing and SEO. Philip also likes to travel to different countries. Message: I hope that you have enjoyed 'Top 10 Best Java Decompilers for Developers' article on Tips2secure. However, if you want me to deliver more items, then please share my post. You can use Social Sharing Widget provided at the end of every post. After all, Sharing is Caring!